The history of the rediscovery and uncovering of Herculaneum. The rediscovery of Herculaneum in the eighteenth century began a long process of uncovering which is still not complete. Buried in tufa rock after the eruption of Vesuvius in 79AD, the site was tunneled into, rob out, vandalized and often ignored until open air excavations beginning in the nineteenth century once again revealed Herculaneum to the world. Herculaneum was encased in tufa rock, formed from the volcanic ash which covered the town during the eruption of Vesuvius in 79AD. The town was lost from view, buried for up to twenty five meters in places. But although lost, the town was not forgotten. The fourth century Roman Peutinger map clearly shows the town still marked. The villagers of Resina, which grew up over the town certainly knew something lay beneath their settlement. The people of Resina were used to finding ancient fragments of marble and strange objects. These were usually quietly sold. Some incidents drew a certain amount of attention such as the ‘ancient building of wonderful elegance’ reported by Fabio Giordano in his Historia Napolitana. But otherwise, Herculaneum was in no danger of being uncovered. In 1709, some particularly eye catching marble was unearthed by a local farmer digging a well. This time, his discovery alerted the Prince d’Elbeuf, a commander with the Austrian army at Naples. The Prince was constructing a palace for himself at nearby Portici. He immediately ordered further explorations. Vertical shafts were sunk and a series of tunnels made through what proved to be the theatre of Herculaneum. But the Prince’s motive was not curiosity but greed. For the next five years, the theatre was not only explored but systematically plundered. Many of the luxurious, eye catching marble facings of the theatre ended up in the Prince’s new palace and even the church in his home town. After the Spanish war of succession in 1732, Naples became a separate kingdom, headed by Charles Bourbon, son of the King of Spain. The new King wanted to put not only his court but his new Kingdom on the cultural map of Europe. The best way to do this was to literally dig up the past. From 1738, military engineers began systematic digs at Herculaneum. More shafts and tunnels began to reveal buildings such as the Basilica Nonius, the mysterious porticus, the palaestra and the spectacular Villa of the Papyri. All were explored and systematically mapped by professionals such as the architect Karl Weber- fourteen in all by 1750. Despite the beginnings of proper archaeological investigation, Herculaneum was still being mistreated. Excavators destroyed many ‘unimportant’ walls and features as they dug for beautiful items to plunder. Statues, frescos and marbles were removed to adorn the Portici palace now owned by the King. Those items that were rejected or could not be removed were destroyed to prevent them falling into the hands of foreigners. With the death of Weber in 1780, the excavations which had begun to lose impetuous. They were soon abandoned altogether when nearby Pompeii began to eclipse Herculaneum. In 1828, digging resumed. This time, it was motivated by true archaeological curiosity rather than greed. The dangerous practice of tunneling was abandoned. Instead, the tufa rock which encased the town was removed horizontally, exposing the buildings of Herculaneum for the first time in nearly 2000 years. Excavators began by uncovering the third of the town’s vertical streets, known as Cardo III. At the same time, they began to discover the buildings lining the road. The House of Argos which had an intact second floor and the House of the Skeleton were amongst the first private dwellings discovered. In 1865, Giuseppe Fiorelli took over as director of excavations. He continued further north up Cardo III, uncovering the central baths, the oldest baths in the town. But the site was now at risk in another way. With the supportive tufa removed, many of the fragile buildings began to collapse. The problem of how to conserve Herculaneum had begun. The twentieth century represented the glory days of Herculaneum’s uncovering. In 1927, Amedeo Maiuri took over as director of the site. His aim was to uncover as much of Herculaneum as possible. He began to removing the slum dwellings of Resina in order to excavate the ancient town. By 1929, Maiuri had uncovered the whole of insula III. 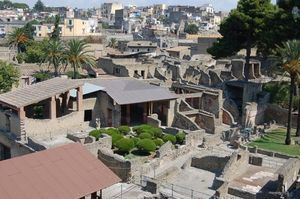 He uncovered many of the town’s interesting dwellings, including the Cliffside the House of the Hotel-the only house in Herculaneum to have a private bath suite, House of the Wooden Partition with its carbonized wooden doors and the House of the Wattle work, a multi-story apartment building. During this period, Maiuri also uncovered the luxurious House of the Stags and House of the Mosaic Atrium which would have overlooked the ancient coastline. By 1934, the whole of the central baths, the Samnite House, House of Carbonized Furniture and the House of Neptune and Amphitrite were excavated. By the time excavations were halted in 1942, the palestra on the eastern edge of the town and, the decumanus Maximus, main street of Herculaneum had been re-exposed. Maiuri’s work was pioneering, and involved carefully reconstructed the e damaged buildings. His one weakness was his rather creative interpretation and display of finds-as in the house of the Weaver where he assembles a loom and other household finds around a body on a bed (interpreted as female when in fact it was male) to tell a touching tale of a young weaver killed in her room. Despite his ambitions, he was eventually halted by Resina itself. The extent of uncovered Herculaneum was set at the Decumanus Maximus and Cardo 111 in the west . But Herculaneum continued to reveal its secrets. In the 1970’s the structurally impressive cliffside suburban baths were excavated. Investigations then progressed to the harbor. A lack of bodies in Herculaneum had long led to speculation that the residents had escaped. In 1981, the truth was revealed when the boat sheds along the shore were discovered to contain the bodies of many of Herculaneum’s citizens, instantaneously killed by the high temperatures of the pyroclastic surge which destroyed the town. Today, the uncovering of Herculaneum continues, with major works in progress along the shoreline and at the nearby Villa of the Papyri as well as to the north west of the town.